The autumn of 2011 presented a change in vision and process for Marty. The previous years, his focus had been to develop a painting style involving acrylic paint and various water-soluble media applied to canvas and wood panel surfaces. All this was combined with abstraction of familiar images and textures. With this new work Marty took a broader approach by investigating various belief systems and culling personal visual impressions. He touches base with New Age, Pantheism/Paganism, Catholicism, Buddhism, Jewish Mysticism (Kabbalah), as well as abstracted perceptions of beliefs. In 2011 Midwest Pressed (Tim Dooley & Aaron Wilson) metastasized from a hip collaborative art moniker to a bona fide limited-liability partnership with an actual physical address and a new air of legitimacy. The currents we have been navigating recently deal with making the transition from academic fine art viability to the production of unique screen printed products made available through Al Gore’s ‘internet’. Worn Out is a collaborative print project working mainly with screen printing. Dooley and Wilson focus on themed bodies of work that highlight both the unique and serial nature of printmaking, or “making each print an individual and successful impression born from the language of the multiple.” The works involve intense layering of color and imagery, often focusing on clichés from pop culture. Zombies, riot cops, unicorns, Bigfoot, kittens, money, and Modernism all make appearances. Displayed from floor to ceiling in grid-like and clustered formats and printed on both paper and t-shirts, the exhibition will present a visual overload of pieces from several series of related works. Worn Out, like much of our collective creative output, walks the line between the museum and the street with a pop art dialogue that does not bother to draw a distinction between high and low culture. The paintings of Teresa Dunn, Ben Duke, and Robert McCann share a ‘more-is-more’ aesthetic. Whether developed from drawing, collage, photos, or life observation, these pictures and stories are ultimately built out of paint. The hard-won image and the craft of painting are revealed in vigorous multi-figure storytelling. Teresa Dunn probes the precarious nature of intimate relationships, where they succeed, fail, or lie in limbo. The narrative worlds created by each artist share a vision in which tenuousness is vital. Tension can keep everything bound dramatically together; but wound too tightly and things fall apart. Jason’s exhibition will feature his mysterious sculptures created with bone, teeth, and found objects. This exhibit is the newest incarnation in the Antecedent Gallery curated by Wayne Propst & Roger Shimomura. Do you love catfish? Join Friends of the Kaw for a crisp fall evening of live music, delicious catfish, and libations – on the banks of the Kansas (or Kaw) River. While you are having a good time, you will also be supporting a great cause; protecting the Kaw River! Also enjoy river art showcasing local artists, Kansas Riverkings artifacts and food prepared by Terrebonne Café. You can learn more about the beautiful Kaw River, and how you can get involved. And meet new friends while enjoying a catfish dinner! Just $10 includes entrance and food! F.D. Brown is a self taught artist from Lawrence, Kansas who began his professional painting career in 1997. He paints southwestern, Native American, western art and recently began a series called “High Contrast” that brings to life iconic images. Mr. Brown is inspired by the rustic lifestyles of the cowboy, the proud heritage of the Native American and the beautiful colors of the southwest and now, the images of cinema and sport in dramatic color. An artist trained in analytical psychology, Margaret Weisbrod Morris’s work is a straightforward blend of metaphor and reality, with a touch of the absurd. Working in a variety of mediums and subjects, her work focuses on visually representing sensory dynamics and visual minutiae to convey the intensity of precise moments in life. Drawn to monotonous, repetitive visual elements, and strange, illogical visual situations, her work juxtaposes emptiness with chaos, calm with intensity to create meticulous, dreamlike, or irrational scenes that are based in reality but are slightly implausible. Morris holds a BFA in painting and printmaking from the University of Wisconsin-Madison, and an MA from New York University. “From the Field” is a break from Mark Collins’s customary assemblage sculptures. A house painter by trade, he began to take note of the patterns and color combinations his work shirts were taking. Naturally, he started collecting them and eventually mounting them. No conscious decisions went into the making of each and he would retire a shirt when it became torn or worn out or too heavy. A native of Memphis, TN, Mark Collins moved to Lawrence two years ago. While in Memphis, he was an active part of the arts community. Mark received a BFA from the U of M as well as, participating in dozens of shows and festivals throughout the mid-south. Mark co-created a gallery and studio space called Plan B that bridged the gap between professional and student artist. This Halloween season, Wonder Fair presents the work of six area artists, illustrators, and zine-makers. In our gallery, you’ll peruse a selection of “Greatest Hits” from the portfolios of Alex Schubert, Kenneth Kupfer, andJohn Malta. Whether drawn for the glossy pages of their own alternative comics, or painted on assignment for the revered New York Times,their recent artwork illustrates the shared history of kids raised in the ‘80s and early ‘90s on a steady diet of mainstream video games and underground comics. Beyond the gallery, guests will once again be allowed to range into the hidden spaces of Wonder Fair, as our back room is remodeled into an interactive, haunted art Installation. Visitors to last year’s Cemetery Cinema may remember Dustin Williams’ pun-filled video store, staffed by a surly ghost, lined with fictional VHS tapes, and entombed in cobwebs. This year, Williams–along with fellow illustrator Cameron Lamontagne and sound artist Jon Linn–will expand his ghostly real estate to open the Dead End Diner. Be sure to visit on our Final Friday grand opening event to pick up your frequent Die-ner card, valid through 10/31/13. This month’s Final Friday Art Walk will feature artists Dilesh Fernando, Ben Kappen with Brad Chun, Felicia Roth, and Don Stevanov. Ardys Ramberg will provide live music and Wheatfields Bakery will be here with breads and spreads. Dilesh Fernando is a pottery artist from Lawrence, Kansas. Mathematical proportions of the Golden Mean influence the function and aesthetics in Dilesh’s art. Fluid lines through surface decoration and glazes enhance the aesthetics, as well as enrich the tactile experience. He endeavors to create vessels for people to use in everyday life and continue to enjoy over the years. In 2000 Ben Kappen began to learn how to furnace-work soft glass with Darren Davis at Rainbow Fired Glass in Tulsa, Oklahoma. He bought a small torch and began to lampwork glass in early 2003. During this time he also began building his own equipment in order to open a soft glass studio in Lecompton, Kansas. Ben hand-built an array of annealing ovens and reheating equipment, along with a 250 pound capacity hot-glass furnace. The furnace was first fired in June 2004 and marked the grand opening of Illuminated Glass. Felicia Roth is an award winning artist from Blue Springs, Missouri. There is a depth of insight represented in Felicia Roth’s art. Her use of color, movement, materials and object matter shows a range that reaches out to everyone. Lawrence photographer Don Stevanov will have his work in the Vermont St. entrance. Local musician/artist Ardys Ramberg will be performing during Final Friday. Ardys loves any melody, whether jazz, folk, or cowboy style, and she writes songs, as well. Don’t miss our annual Breads and Spreads. Wheatfields Bakery will be here, and you can sample the great baked breads and homemade spreads for which Wheatfields is famous. Phoenix Underground will feature artist Kaylyn Munro as well as sculptures by Beatriz Parra Thompson, a KU ceramics graduate student. A lifelong artist, Kaylyn received a Bachelor of Fine Arts in Printmaking and Painting at the University of Kansas. She went on to study architecture and practiced that craft in the Kansas City and Lawrence area for 25 years. Since 2009, she has focused on painting and printmaking fulltime. Her work has been shown in a number of regional and national shows and is in private collections in Hong Kong, California, Texas, Pennsylvania, Louisiana, Missouri and Kansas. She teaches oil painting to beginning and intermediate level students at the Lawrence Arts Center. Please join us at Essential Goods Friday, September 27th at the opening reception for Lawrence artist Ryan Paget. We will be showcasing a variety of Ryan’s paintings and ceramic sculptures. It will be a great evening— we hope to see you there! Ryan has lived all his life in Kansas and draws inspiration from the simple and rugged beauty of his surroundings. In addition to being an art teacher and part-time artist, he is driven to build and repair most anything. In his artwork he strives to create dynamic visual effects and thought-provoking yet minimal narratives derived from his life experiences. His favorite part about making art, other than getting his hands dirty and listening to music, is expressing his ideas with total autonomy. Celia Smith is a graduate of the University of Madrid, Spain, her country of origin. A resident of Lawrence for many years now, she works full time in her studio on the southern edge of town. Using sketches and drawings made in the field, Celia composes her paintings. Some works are simple landscapes, others are based on myths, traditional ballads and stories. Some are based on feelings, and many are symbolical interpretations of life as it is, with the positive and the negative forces at play, at odds, or in balance. Celia has received a number of awards and recognitions from the states of Kansas and Missouri and shows regularly in Idaho, Montana, Washington and South Dakota. While some of her work is done on commission, she is also an active participant in juried shows and art fairs, from which she has received several awards and cash prizes. In our area, Celia participates in most local Arts Fairs and shows, such as Art in the Park, Mulvane Art Fair, Art Westport, the UnPlaza Art Fair , the Lawrence Art Walk,, the Bizarre Bazaar and the Holiday Art Fair. Some of her work is available at Ten Thousand Villages during September and Final Friday, and her studio is open to the public, by appointment. Patterns of behavior, natural forms, sound and experience collaborate to form identities. With these identities come perceptions, associations, and conclusions. Utilizing the natural world reflects a fascination with time, people, places, and objects; my aim is to show the beauty in everyday experiences, and seemingly ordinary moments. Since, moments and human experiences are always fleeting, I like to record these moments as well as draw my own conclusions. Making use of contrast and color, as well as form and texture, I am able to condense my emotion and interface my language with my experience. A collaborative show with works by Alicia Kelly and Kelly Kearns. Alicia and Kelly have been working together to create new pieces, getting inspiration from each others unique style from passing work back and forth. The collaboration was a way for each artist to work spontaneously and find new ideas within each new layer. They will be showing their individual works, their collaborations, and installations at The Percolator. Emmalee Schaumburg of Schaumburg Photography and Bombshell Pin-up Photography will be showing her work at Au Marché this month for the Final Friday Art Walk. Visit Au Marché and buy 3 Christopher Elbow Chocolates to get 1 Free ($1.75 value) from 5pm to 8pm. Emmalee Schaumburg fell in love with photography when she discovered her parents’ 35mm camera in high school. The darkroom began to pull on her creative side and it didn’t let go. After years of photographing various subjects she opened up a photography studio in North Lawrence. Today, her favorite subjects include, newborns, children, high school seniors and pin-ups. Kathleen Anderson is a Lawrence resident who has been painting in watercolor and oil for the past 14 years. She loves color in all its brilliance and subtleties with subject matter that includes landscapes, city scenes, seascapes, flowers and animals. She is a member of the Lawrence Art Guild, the Greater Kansas City Art Association, and the Missouri Valley Impressionist Society. Her work hangs in private and corporate collections and has been displayed in 1109 Gallery in Lawrence, SouthWind Gallery in Topeka, and Images Gallery, Buttonwood Gallery, and ARTichokes Gallery in the Kansas City area. Linda Baranski is a mosaic artist, painter and printmaker living in Northeast Kansas. She creates mosaics using Italian vitreous glass tile (smalti), stained glass and found objects. Her paintings, monoprints and mosaics range from Realism to Abstract Expressionism and use oil, acrylic, watercolor and mixed media. After studying mosaic restoration in Ravenna, Italy, the direction of her mosaic work took on an iconic quality. In 2002 Linda co-founded the Library Friends of Art at the Topeka and Shawnee County Public Library to support the library’s Sabatini Gallery. She has been an Artist-in-Residence at the Red Barn Studio in Lindsborg, Kansas for many years. Linda received Lawrence’s prestigious 2009 Phoenix Award as Arts Administrator. She served as president of the Lawrence Art Guild for three and a half years, and four years as Gallery Director of the 1109 Gallery in Downtown Lawrence. Laurie Culling is a visual artist and active visual artists’ advocate, living in Lawrence. Ranging in style from realistic to abstract, her art explorations feature a variety of mediums including acrylic on canvas, mixed media on gypsum, monotypes, watercolor, pastels, hand-made paper collage, fabric and beads. Her artwork has been exhibited locally, regionally and nationally and she has received numerous awards including Lawrence’s prestigious Phoenix Award in Visual Arts (2002). Her works are in many private, public and corporate collections. Laurie is a former Lawrence Art Guild co-president and vice-president, the co-founder of the Phoenix Gallery (1982), a founding member of the F.A.N. Club (1987) and Artist for the Bert Nash Community Mental Health Center (1988). Laurie volunteered as art exhibit coordinator on behalf of the Lawrence Art Guild for the Lawrence Public Library for 20 years. She was the volunteer Assistant Director of the Lawrence Art Guild’s 1109 Gallery in Downtown Lawrence. Dian Hauser is a mixed media artist living in Oskaloosa, Kansas with her husband and 14 turkeys (among other animals). She received her MFA from the University of Kansas in 2000 and has been happily making art ever since. Her artwork references stories, verbal and written, that have a metaphysical basis. Dian uses metal and wood as a ground for her collage/ drawing/ painting explorations. She has exhibited her work locally and regionally. Dian’s art hangs in corporate and private collections. Dian was the Lawrence Public Library Art Liaison until 2013 and has had the pleasure of working with many Lawrence artists. Women of Lawrence Film (WOLF) is an organization of female filmmakers in Lawrence with the mission of collaborating, supporting and educating women in the art and craft of filmmaking. “Femme Fatale Final Fridays” is an event that showcases short films made by women filmmakers. Films are screened for free for the public and there is a cash bar. Screening will be held at the Replay Lounge 946 Massachusetts St Lawrence, KS 66044. Screening begins at 5:00pm with repeat screenings at 6:00 pm and 7:00 pm. Indigenous pre-party in the parking lot! This month the featured artist is Violet Sant, paintings of nature. Hey, Lawrence – we are a new store in town on Mass. Street. Rockin’ Parrot moved into 1027 Massachusetts St. on Aug 10th. We are a perky, eclectic, and upscale consignment boutique with a mix of clothing and antiques that will appeal to people of all ages and pocketbooks. We have pocketbooks for sale too by the way. We are also hosting artists for the Final Friday Artwalks. The artist we will be hosting this Final Friday is Diana Lehmann. She is a local photographer that specializes in photos taken in Kansas. She shows the beauty of Kansas in her compositions she creates. We hosted her in August and had many patrons look at and admire the beauty of Kansas as seen through her eyes. The title of her exhibit is “In Your Backyard”. So stop by on September 27th to admire her work as seen through her camera lense in her exhibit entitled “In Your BackYard” . Cider Gallery Fine Art is pleased to present a group exhibition for the September Final Fridays reception. The gallery will feature works from a selection of Cider Gallery artists, including new works from artists Hunt Slonem, Jeremy Rockwell, Tim Forcade, Stan Herd and John Sebelius. The newly acquired 1977 Andy Warhol screenprint is also on display in the gallery. Cider Gallery Fine Art is open 1-5pm Tuesday through Friday and by appointment or chance. The films of Mike Anderson with an artist talk after the showing. Thursday, September 26th at 7pm. Visual artist Mike Anderson creates the realization of a self-invented myth through his narrative project, The Giant. Through his film installation, Anderson offers an opportunity for the viewer to become immersed in his constructed universe, challenging their perception of the physically real and unreal by skillfully rendering a digital environment. Originally a painter, Anderson applies his knowledge of the medium when using digital film software, developing believable three-dimensional spaces with a two-dimensional art form. While using digital editing to manipulate his films, Anderson is reminded of nineteenth century academic painters, carefully recreating scenes and landscapes through great artistic acuity. In addition to his film installation, Anderson will display source material from the creation of The Giant. These materials will include photographic prints of digital sculpture in addition to the release of a book, which will contain the original story as well as illustrations and sketches that lent themselves to the progression of The Giant as an idea and project. Anderson is excited not only by the capabilities of digital technology in its ability to aid in the creation of works, but its potential to preserve the integrity of a project. The longevity as well as the portability of digital artwork ensures that the work will not suffer visual or physical degradation through format change or time. Maintaining the integrity of his work and clarity of narrative is very important for Anderson. The communication of his vision is a burden the artist feels acutely; through his work, he is able to participate in the tradition of storytelling that has compelled human beings throughout history. Anderson feels that it is this desire to share our ideas and imagination that drives many to create all forms of art. Liberty hall with feature the film’s of Mike Anderson followed by an artist talk on Thursday, September 26th at 7pm. Giant opens at The Invisible Hand Gallery’s new location inside The Cider Gallery at 810 Pennsylvania street on September 27. 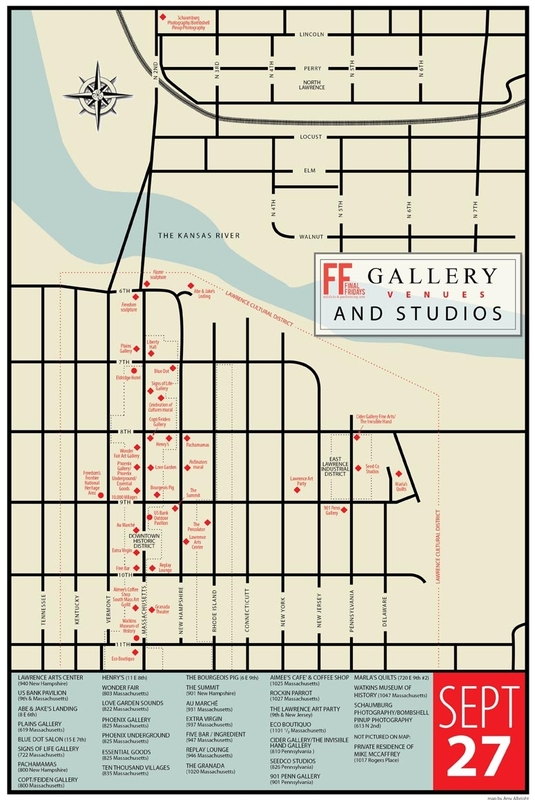 We’re going to have a great Lawrence Art Party on Final Friday, September 27. We’ll be broadcast live on Lawrencehits.com, with great art, refreshments, music and more! manly men and photographed them doing manly things in a pinup kind of way. Come grab a beer or glass of wine, and prepare yourself for something you won’t forget. This facetious representation of the modern day pinup will be an unforgettable night. Emmalee Schaumburg fell in love with photography early on in high school. The darkroom began to pull on her creative side and it didn’t let go. After years of photographing various subjects she opened up a photography studio in North Lawrence. Today, her favorite subjects include, babies, high school seniors and pin-ups. Bombshell Pinup Photography photographs everyday women and transforms them into a modern day pinups. Our mission is to prove every girl of every age in every walk of life is gorgeous and to help her see it. Local artist, Michael McCaffrey, will be exhibiting paintings in this private residence studio on the West Side. McCaffrey has his Masters of Art from Indiana.